Last year, I made the mistake of not reading the small print. The small print in this case wasn’t on a contract; it was on a website. As anyone who reads my stuff knows, I love wild food foraging, and one of the things I have on my to-do list is sumac, its tangy flavor crucial to so many dishes, especially to Mediterranean and Middle Eastern cuisine. 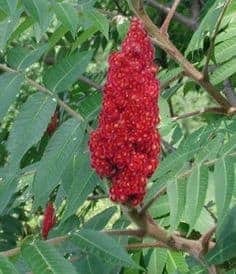 Since learning that sumac grows wild all over the Berkshires, I was psyched, and immediately went online to learn how to harvest it in New England. To make a long story short, my enthusiasm overwhelmed my common sense. The website’s author instructed readers to harvest in August, so I enlisted husband, daughter, and son-in-law to join me in the hunt. After all, the latter two are wonderful, adventurous cooks. Armed with plastic bags, we plucked dozens of the ruby red blossoms and brought them home to process on the dining room table. But, UGH. The blossoms were infested with lots and lots of tiny, wriggly worms. I had to throw out the whole lot — as fast as I could hustle myself out the door. The website was indeed very instructive, but I had failed to notice that it was written in northern Maine, whose season has to be a good month later than ours in southern New England. Lesson: pay attention to the small print. Tomorrow we go out to try again, the blossoms having just turned red in the past week. Stay tuned. I have a craving for shwarma. Proust had his madeleines. For me, opening a container of za’atar releases an aroma that sparks memories of strolling through the shuk, the golden light caresssing ancient stone walls. The scent also stimulates my appetite for fresh-from-the-oven pita, warm, soft and chewy, with a salty and piquant tang. 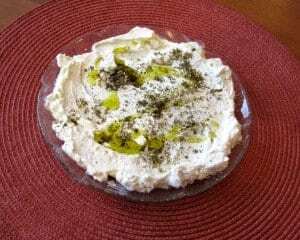 The za’atar that we know from its association with labneh and hummus on mezze plates is a condiment made from a mix of spices, herbs, and seeds, and the recipe varies from place to place. But in fact, the name za’atar also applies to a family of related herbs that grow in the Middle East: oregano, savory, marjoram, thyme. I think it most closely resembles oregano, at least the bush that grows in my garden. 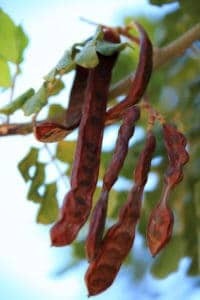 While doing research on the carob, I learned a lot about its history and culture. This legume is touted as a healthy alternative to chocolate, as it has lots of nutrients and no stimulants such as caffeine or theobromine to give you the jitters. However, the bean has long been denigrated as an inferior chocolate wanna-be, nothing more than a poseur. I found a recipe that I have adapted to include orange juice and coconut oil. These two ingredients give it an amazing tropical vibe. This delicious cake is so moist it really doesn’t require frosting, but including it doubles the pleasure. And, it redeems the lowly carob! Grease and flour two 8-inch round cake pans. In the bowl of an electric mixer, combine first five ingredients. In a second bowl, mix the oil, milk, and eggs. Pour liquids into dry ingredients and beat, starting slowly. While beating, add the coffee and gradually increase to high speed. Pour batter into prepared pans. Bake for 30 minutes or until toothpick placed in center comes out dry. Cool for 20 minutes, then tip cakes onto cake racks. When cakes are completely cooled, ice. In bowl of mixer, beat butter until creamy. Gradually add confectioners’ sugar with mixer set to slow speed so that it won’t fly all over the kitchen. Increase speed to whip icing to a nice, fluffy texture. So, I promised to bring muffins to my beloved father-in-law who is currently in a rehab hospital. 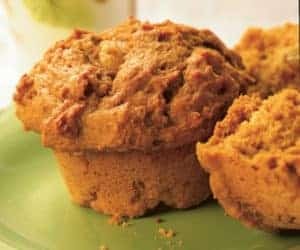 Pumpkin spice seemed seasonally appropriate and the recipe online got five-star raves, so what could be bad? I donned my apron. When the muffins came out like soup, I was more than a bit annoyed. After all, I had followed the directions carefully. Or had I? Returning to the website on which I had found the recipe, I realized that the 1 1/4 cups of flour was actually 1 1/4 pounds. Because we know several professional chefs who weigh their ingredients, I was aware of the practice, but had never actually seen a recipe calling for that. Attempt #2 worked out much better, even with substituting half the butter with applesauce. Next time I will try them using my very nice digital scale. Moral of the story: Read carefully. Few people, either on foot or in cars, were on the road this morning, but who could blame them? The oppressive heat and humidity had been hanging on for days, with no relief in sight. But the weather didn’t deter us; we were off on our very first mushroom hunting expedition. I had been dreaming about this for months and nothing would stand in my way. 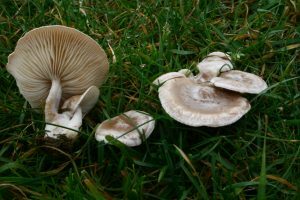 We joined up at Kennedy Park in Lenox with some other folks who had traveled some distance for the hunt and were thrilled when John Wheeler, President of the Berkshire Mycological Society, arrived soon after to teach us some basics about mushrooms and mushrooming. Just as I thought we would embark on our quest, he burst our collective bubble by telling us that commercial pickers had wiped the park clean. But, like a novelist who knows how to devise a good plot, he then redeemed himself by bringing us to another place further down the road. Birdsong and the babble of running water, along with the occasional snapping twig, filled the woods with cheerful music. The forest floor was damp and fragrant with the aroma of decaying leaves. And slippery. I found long branch to use as a walking stick that turned out to be a wise decision. We hiked down a hill, over felled trees, under branches, and through said babbling brook. I have to admit I expended more energy attempting to remain upright than I did actually seeking out fungi. Perhaps with practice this will get easier, I thought. It turned out that John had to leave early to attend a wedding, so we were left to fend for ourselves. Afraid that we would get lost in the woods, we tried to follow him as he ascended the steep embankment with the agility of a gazelle. We realized quickly that we were not going to make it. Remember “slippery?” Well, my feet lost their grip on the muddy slope and as I slid downward, one leg wrapped around a tree while the rest of me continued down the slope. Trust me when I say this was not the most attractive pose I have ever been in, and I pray that nobody had a camera at that precise moment. Although only one member of our party found a single oyster mushroom, we did succeed in netting some wild ramps and wild ginger, so the hike wasn’t a complete bust. The beauty of exploring nature with the possibility of finding treasure is enchanting, and I think probably addictive, but next time I’ll stick to flat terrain. And I’ve already ordered a couple of field guides to ensure that I don’t ingest the wrong type of fungus. A long time ago I attended a Billy Joel concert with hubby and friends. Seated across the aisle from us was the artist’s then-wife, Christie Brinkley, and their toddler child. (I did say this was a long time ago). Both mother and child were wearing the type of ear protectors that one sees worn by airport workers out on the tarmac. They needed them because the music was almost-literally ear-splitting. I had to cover my ears the entire evening. What does this have to do with my usual gig, writing about food? Hot pepper. Hot peppers have become all the rage. 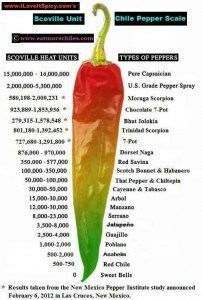 The higher the Scoville rating a pepper has, the greater the bragging rights among its fans who eat them. With names like Carolina Reaper and Bhut Jolokia Ghost Pepper, I can practically see the smoke coming out of their ears. While the high concentration of capsaicin found in hot peppers, when incorporated into an ointment or cream, can help people deal with pain, certain varieties of hot peppers can be dangerous when consumed. Capsaicin is actually a neurotoxin and in large enough doses can cause seizures, heart attacks, and even death. Historically, the hot pepper had a purpose. In fact, anthropologists believe that it may have helped to ensure the survival of some cultures. Before refrigeration was common, people living in tropical and subtropical climates needed a way to preserve their food. Hot peppers can help protect against the growth of bacteria and fungi. In fact, researchers at Cornell University have found that capsaicin kill or inhibit up to 75% of bacteria in food. But aside from those reasons, what is their purpose on our dinner plates? With apologies to Harry Burns of When Harry Met Sally fame, when there’s too much pepper in your paprikash, you can’t taste the food. It’s like going to a concert and not being able to hear the music for all the noise. Son-in-law Adam recently completed his annual olive-brining ritual. He buys the raw fruits from an online source, and then in his kitchen prepares them in a variety of ways, from traditional to spicy-hot. A few weeks ago he presented me with a jar containing his latest production. These olives were unlike any I had ever before eaten. While the flavor was somewhat similar to the store-bought greens, the texture was al dente, almost crispy. And, they were bigger than the largest olives I have seen. As I tasted one, then two, memories surfaced of the sun-drenched Tuscan countryside, where groves of olive trees in straight rows gambol up and down the hills, their gray-green leaves shimmering in the light. And then more memories bubbled up from even further back, to my time living in Israel, where olive trees grow even on the main streets of the cities. While living in Jerusalem, I came into possession of the novel The Last Temptation of Christ, by Nikos Kazantzakis. It was a great book altogether, but one scene in the story stands out in my mind for its vivid description. Jesus stops during his travels to rest under a tree. 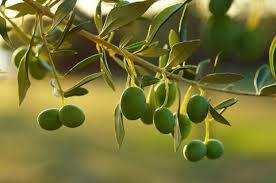 He extends his hand and plucks an olive the size of an apple from its branches – enough to serve as lunch. What an image! Upon reading it, I made my way directly to King George Street and picked a couple of tiny green olives. I then made a big mistake: I bit into one. Bit, as in bitter. Yuck. Olives need to be treated, either through brining or curing. Lesson learned. And then more recently, while on a saunter through Jerusalem, we came upon two women picking olives in the Mishkenot Sha’ananim neighborhood. They had come from outside the city specifically for this purpose, but had forgotten to bring a ladder, or even a tarp to collect the harvest, so 6’4″ hubby offered to pick from the higher branches. I helped work the lower ones. Until Adam made olives, I had never considered doing it at home. Now I think I may try next year. With every bite, I can be transported from the winter gloom to a warm and beautiful place. In the meantime, since we live in New England, buying online is probably the best strategy for me. It’s Hanukkah this week, and with it comes the temptation of foods fried in oil. The traditional story behind the practice is that the little cruse of oil sufficient for lighting the Temple menorah (candelabra) for only one day miraculously lasted for eight. We all know about the latkes (pancakes) and sufganiyot (jelly donuts) that are the oil-heavy stars of the Hanukkah menu. They are delicious and, hey, we only eat them once a year, so enjoy yourself. But there is also a custom of eating cheese on the holiday and it has a feminist, if somewhat grisly, backstory that comes from the biblical Book of Judith. About 2200 years ago the Syrian-Greek army laid siege to the town of Bethulia, a mountaintop town overlooking the Jezreel Valley. As the siege continued, the townspeople suffered from increasing hunger and, feeling desperate, declared their intention to surrender when the food ran out. But Judith, the beautiful daughter of the High Priest Yochanan, came up with a plan. 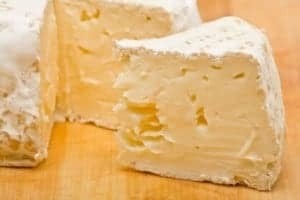 Using her knowledge that Holofernes desired her, she approached him with a basket of her homemade cheese, bread, and wine. Eating the salty cheese made the general thirsty, so she plied him with the wine. The more wine he drank, the drowsier he became, until he fell asleep. Judith then took his sword and beheaded him. She brought the head back to the town elders in a bag and urged them to attack the enemy, who were sure to panic once they realized that their leader was dead. She was right. The troops fled and the town was liberated. So, in Judith’s honor, perhaps we should throw a wine and cheese party. (No swords allowed.) Or, combining the two culinary traditions, maybe we should eat fried mozzarella sticks. Here we are on the eve of Thanksgiving and the house is filled with fabulous aromas from a wide range of dishes. And while I spend most of the year trying new recipes and experimenting with new foods, both for my newspaper column and in researching my book, when the holidays come I rarely deviate from the tried and true. Thanksgiving is one of those holidays that demand the tried and true. Comfort food is what the family wants, and of all the traditions that surround the holiday, turkey is almost universally the centerpiece. Everybody (except the vegetarians) demands turkey. (I did go on strike one year and serve chicken, but was almost disowned for that faux pas.) For me, the only reason the bird exists is as a vehicle for stuffing. I love stuffing. And since tiny changes are sometimes allowed, a couple of times I’ve tried to stuff kasha into my turkey, but frankly, the tried and true bread stuffing is really my fave. As for mashed potatoes, this is not a dish anybody in my tribe has ever served on Thanksgiving – on any branch of either hubby’s or my family. But, when my hairdresser Shannon cried, “What?” You can’t have Thanksgiving without mashed potatoes!” I felt this might be the year to try them, perhaps because she was so passionate about the potatoes – or perhaps because she was holding a pair of sharp scissors at the time. I can’t be sure. However, considering that the preparation of said dish is a major pain in the tuchus, I delegated the task to my first-born child, who accepted the assignment with great aplomb. Luckily, he is as good a cook as he is a sport. So this year, mashed potatoes will be on our family Thanksgiving table, squeezed in among the turkey, stuffing, Brussels sprouts, cranberry sauce, Jello mold, squash soufflé, apple crisp, and pumpkin pie. Time to let out the waistband. That’s tradition. My obsession with stalking the wild asparagus continues. Dressed like Miss Marple with my hat and Wellies, I love to gather apples, pears, chicory and, of course, my beloved grape leaves. Last week, while searching (alas, failing) to find a new source of grape leaves in a nearby park, I did discover dozens and dozens of pale green orbs hanging from trees like so many Christmas ornaments. I plucked one low-hanging one as well as a small branch of leaves, and posted photos on Facebook, hoping that at least one friend could help me with identification. Within minutes I had my answer: Black walnut. Unfortunately, I had no idea that cutting into the hull of that nut to make the photos would render my fingernails dark brown for two long weeks. Note to self: wear gloves. Finding nuts not infested with slimy little worms was another matter. The longer they remain on the ground, the more likely it is that they will attract the critters. Yuck. So, why not just pick them straight from the tree? Well, if you happen to be 20 feet tall or own a cherry picker, that would be a fine solution. I happen to be 5’7″, and can barely reach the lowest branches. After one tree’s worth of nuts, we headed home to begin the next phase our project. That turned out to be the hard part, involving water, an exacto knife, and a drying tray, none of which steps yielded anything we could actually eat. The phrase “tough nut to crack” must have been invented for the black walnut. No simple nutcracker is sufficient here. To get at the meat inside a black walnut, a sledgehammer is the only way to go. Another note to self: Sledgehammers can pulverize the nutmeats. Oh, but what a splash they’ll make as a Thanksgiving dessert. One Potato, Two Potato, Three Potato, More!